The Confederation of African Football (CAF) announced, on Sunday, that the Red Camels of Eritrea have pulled out of the 30th edition of the coveted African Cup of Nations scheduled for Morocco next year. The Eritrean National Football team, who have struggled to make an impact on both continental and international platforms, were set to play South Sudan in a preliminary qualification match for the tournament. CAF has disclosed that the South Sudanese team will proceed to the next stage of the competition, where they are to face Mauritius. It is currently unclear why Eritrean authorities decided to abruptly stop the team’s from participating in the competition – which is regarded as a stage for the continent’s best players. However, there are speculations that the government’s tough stand may have been influenced by the repeated defections of Eritrean players and other professionals who accompany the team on international duty abroad. Since 2009, over 60 Eritrean sporting professionals have reportedly absconded from the team. Reports indicate that the mass defection is primarily being influenced by dissent against the plans and strategies of the ruling government. Thousands of Eritrean migrants brave dangerous odds to escape repression in the country which is located just on top of the horn of the continent, according to rights groups. The lack of democratic freedom as well as restrictions on civil and religious liberty have been cited by many commentators as contributing greatly to the the current status quo. The Eritrean government temporarily withdrew the Red Camels from the East and Central Africa Senior Cup Challenge between 2008 and 2009, reportedly to address concerns over Eritrean nationals bolting from their posts while on international duty. Although the government has increased the amount travellers are required to pay to about 100,000 Eritrean Nafka, reports indicate that sporting officials and athletes persist in their attempts to seek asylum abroad. Following their elimination from a regional competition in Kenya last year, about 9 footballers and the coach of the Eritrean team disappeared from their lodging. The Red Camels are yet to win any trophies since the team was formed in 1992. Currently, Eritea is ranked 200th on the FIFA World Ranking table. 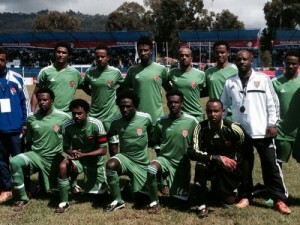 Prior to this revelation of the team’s withdrawal from the competition, the Red Camels lost their chance to appear at the 2016 World Cup after losing to Rwanda – despite putting up an impressive performance.